Yesterday morning, I woke with some e-mails from Ryan, about 2H sets news. We then agreed he will write a post, that I'll publish here later at TBs . Now let's see which news, Ryan has to tell us. 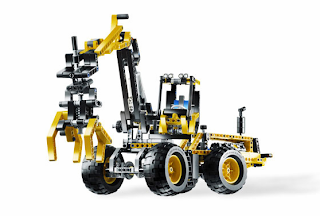 LEGO's official website lists the new TECHNIC sets for the second half of 2009. The site also mentions their partcount, shows more (hi-res) pics of the models and also has pictures of the respective B-models. 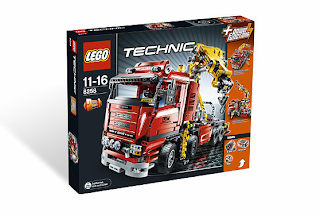 For the 8258 Crane Truck and 2009 TECHNIC flagship there is also a 360 degree animation available. It is possible to stop the animation so you can take a closer look at the back of the model. 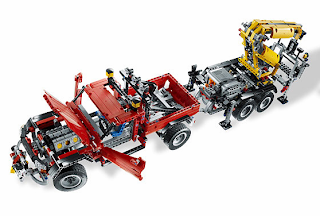 There is not yet sign of set 8063 (Tractor with Trailer) at LEGO.com, however one reader here (Nomad) commented a few days ago, to have seen it at the 2H Australian catalog . Let's take a closer look at the new images and make a synopsis of the information that has been available for the past months. Looking at the pictures it is clear to see the set makes use of the new panels, that are meant to replace panels #20, #21, #22 and #23. The panels available in this set are in black and red. The ribbed back of the panels are used to form the shovel in the front of the groomer. From the pictures, this set also includes the new 'Axle Joiner Perpendicular 3L' (63869) as well as the T-beam, both in light bluish grey. The set also does not use any stickers, which is an absolute plus. On the pictures it is hard to tell, but it seems the treads, that were introduced in the 2007 Snowmobile (8272), are in black (the same used in 7645 Mars Mission set from 2008). The groomer seems to have two geared functions: lifting and lowering the back shovel and moving the front shovel to the left and right. The knobs to move these functions are situated behind the cabin. 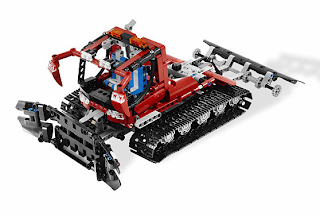 The B-model, a snow expedition vehicle clearly shows this set also uses the new H-shaped beams that first raised our attention in some of the new 2009 Bionicle sets and the 8258 Crane Truck. The snow expedition vehicle seems to have only one function, tilting the dumpster in the back. The knob to arrange this is situated on the top of the cabin. 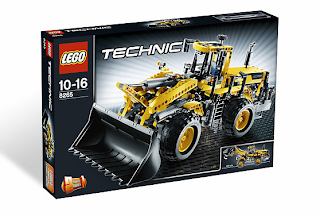 The great thing about this set is that is uses three Linear Actuators and re-introduces the bucket that was last used in set 8455 (Back Hoe Loader) in 2003, and 8439 (Front End Loader) in 2004. 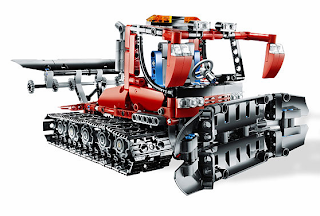 Unfortunately the set uses stickers, even though only one picture on LEGO.com shows the model with the stickers applied. There seem to be only 4 stickers used in this set. The design was by Markus Kossman, who is known for his yellow construction vehicles and his preference to combine studded and studless beams. 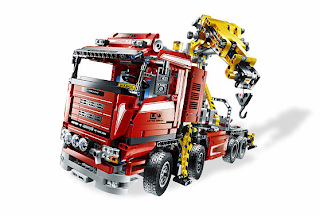 Kossman was also responsible for sets 8421 Mobile Crane and 8275 Bulldozer. The set makes use of the new H-shaped beams (64178, 64179) that only seem to exist in light grey at the moment. 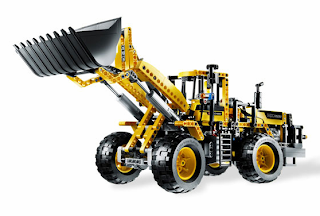 It uses the tires also used in 8295 Telescopic Handler as well as a V-6 Engine. The new differential is used in the front of the model, but I have been told it is also present in the back, making this a 4WD! The model makes use of a driving ring and the gears for this (mainly 16t gears with and without clutches) are located below the cabin. The switch to change functions is located right next to the cabin. The knob to set things in motion is at the back of the loader. 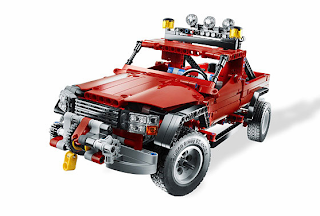 This set also makes use of the new 3L Universal Joints. My guess is it uses at least 4. The B-model is a Forest Logger that appeared in several sets as a main model, for instance sets 8040 and 8044 Pneumatic Universal sets and as a main model in set 8443. This model is rather disappointing, using only one LA and despite the V-6 engine looking rather empty. The crane at the end of the arm is moved with a worm gear and the knob to lower and raise the arm is situated right next to the LA. The lower part of the arm can only be moved by moving a knob right next to it. No gears whatsoever. The cabin and arm seem to able to rotate, which is a nice extra. Still, this is a rather quick effortless attempt to make a B-model. 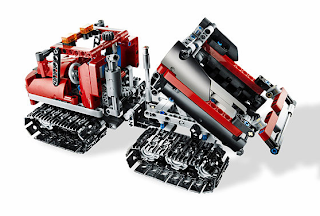 Most likely there won't be any printed instructions in any of the 2H2009 sets. This 2009 flagship model and a personal favorite was designed by Uwe Wabra, also responsible for the exquisite and very realistic looking 8285 Tow Truck. Funny thing is, both 8285 and 8258 have the exact same amount of parts, 1877. 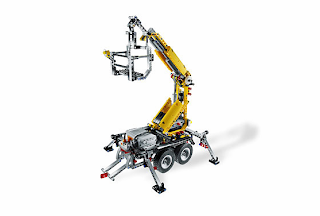 The model uses and XL motor, a power switch and has a 4-way transmission to control two LA's in the crane, the outriggers and the rotation of the crane. New parts include the new panels, also used in 8263, the new H-shaped (64178) and rectangular shaped (64179) grey beams, new TECHNIC 'Axle Joiner Perpendicular 3L' (63869) and new studless gear racks (rumored to be 11L and 13L). The set will be about as big and wide as the 8285 Tow Truck, making these excellent brothers. Unfortunately the set uses many stickers, on about every panel available. 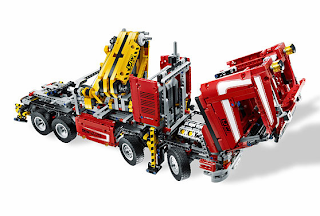 Also the color scheme, reminiscent of the messy looking chassis of set 8274 with a mix of light grey, yellow and red. Yet, the cabin and overall look of this Crane Truck are excellent. 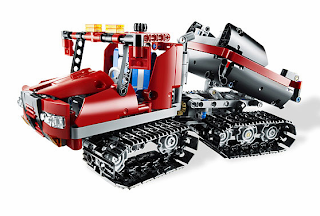 LEGO.com also provides us with a 360 degree animation that can be stopped to take a closer look at some angle we hadn't seen before. The cabin can be lifted to expose the V-8 motor. A remarkable discovery when stopping the animation at the backview is that the beams of the outriggers are place above each other and not next to each other, making use of the new T-beams. The truck has a double steering function and seems to be using a lot of different (clutched) gears. The B-model, a Tow Truck with Trailer is a pretty nice model, reminding me of the B-model of the 8289 Fire Truck. Nice feature is that the trailer can stand on its own. A rather looking model, especially the truck itself, even though it does not have as many functions as the main model. Very good post Ryan. Thanks! The new models are now available for ordering from S@H, at some European countries too. To some extent, I agree with the stickers point. However the good thing about stickers is that we don't need to apply them, if we don't like. Nothing special for this year...But where is the tractor? BTW thanks for the post Ryan! Any word on when these sets will be available in the US through S@H? If we can take 2008 as an example, I'd say begin of July. The crane truck looks pretty sweet. Regarding the stickers - I hardly ever apply them when I put a set together. I just don't care for them, considering that I'll break the model down and use the parts for something else. Shop at home USA edition has a shipping date of 5th August for the Crane Truck! They are already listed at most European S@H countries, despite still without pricing and shipping dates indication. The Euro prices may include the VAT, which may explain the higher prices. Also.. is it just me, or do others consider knobs/dials/controls at the end of an arm/boom a bit of a cop-out? 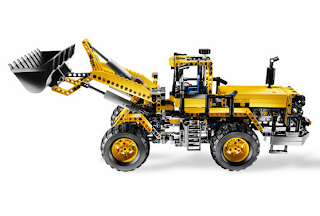 I think models are much more technically impressive, if you can control all the major movements from one place, like a real operator would.. Models that do this well: 8868 Airtech Crane Truck.. 8455 Backhoe, 8480 Shuttle, the recent 8294 Excavator and heck..
even the original 856 Bulldozer had all the controls at the back of the vehicle. How lousy would that have been, if you had a lever at the front, to tip the bucket? Just a shame that the winch on the crane truck isn't motorized, instead of being a dinky hand-knob on the crane-arm itself. I fell in love with the 8289 B model. I really like the BIG crane truck. 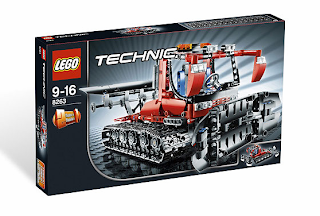 leaving nostalgia completely out of it (which I always do when I Judge any new release from technic) then I can say that this is ALMOST a return to form for technic. I still dare the designers to do better but I will deffinately be getting this. 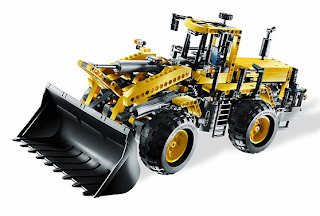 As for the front end loader lets just say i'm still hoping for pneumatics next year ha ha! Somehow I guessed the Front Loader's B-model would be a log loader... ;) That makes the Pneumatic Front Loader (sorry for not putting any links, but I don't have its set number in my head, and I'm posting this from my mobile phone; anyway, it's the one that was re-issued twice) homage complete! 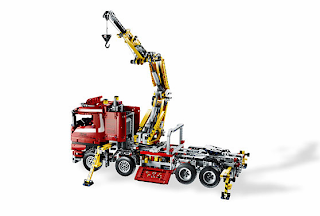 Come to think of it, the Crane Truck now reminds me of an homage of sorts of the 8868 Air Tech Claw Rig: a large truck with a motorised arm and "auxiliary" mechanisms. However, I'd still love to see a proper revival, with a clawed arm moved by Power Functions pneumatic elements... Also, I too really dig its B-model: great looks combined with (hopefully) great functionality. Since the primary doesn't appear to feature springs, I hope it, being an off.road vehicle, has at least pendular suspension. As for the Snow Groomer, even though the B-model appears to have less functions than the primary, it looks so sweet! Besides me, each time my mom offers me a set, I hear: "This one is not to destroy! ".